Given the enormous amount of multi platform content dedicated to beauty topics, we wanted to learn which source women trust to help them discover the latest beauty trends. As part of the POPSUGAR Insights Q2 2014 beauty study, we asked women to tell us where they go to discover new beauty trends. Women love to discover the latest beauty trends via content and rely on beauty sites and blogs to help them identify what's hot in hair, skin care, and cosmetics. 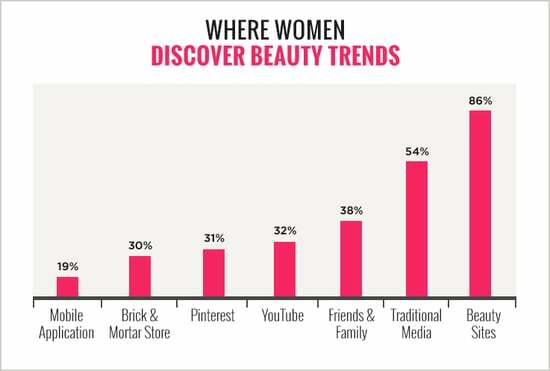 Overall, 86% of women typically discover new beauty trends via websites and blogs. Traditional media sources ranked second overall, with 54% of women discovering trends via TV, magazines, or newspapers. Friends and family ranked third overall with 38%, followed by YouTube (32%), Pinterest (31%), and brick-and-mortar stores (30%). Mobile applications ranked seventh overall, with 19% of women typically discovering trends via a mobile app.